If humanity is to survive long-term, it must find a way to get off planet Earth -- and fast, according to famed astrophysicist Stephen Hawking. In fact, human beings may have less than 200 years to figure out how to escape our planet, Hawking said in a recent interview with video site Big Think. Otherwise our species could be at risk for extinction, he said. "It will be difficult enough to avoid disaster in the next hundred years, let alone the next thousand or million," Stephen Hawking said. "Our only chance of long-term survival is not to remain inward-looking on planet Earth, but to spread out into space." Humans stuck on Earth are at risk from two kinds of catastrophes, Hawking said. First, the kind we bring on ourselves, such as possible devastating impacts from climate change, or nuclear or biological warfare. A number of cosmic phenomena could spell our demise, too. An asteroid could slam into Earth, killing large swaths of the population and rendering the planet uninhabitable. Or a supernova or gamma-ray burst near our spot in the Milky Way could prove ruinous for life on Earth. Dangerous aliens may want to take over the planet to use its resources for themselves, he said in the series. 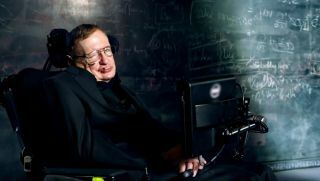 It would be safer for the survival of our species if we had people living on other worlds as a backup plan, Hawking proposed. "The human race shouldn't have all its eggs in one basket, or on one planet," he told Big Think. "Let's hope we can avoid dropping the basket until we have spread the load." See the full monologue from Stephen Hawking here: http://bigthink.com/ideas/21570.